An accident on Thursday morning on Route 12 A in Lebanon remains under investigation. Lebanon Fire Chief Chris Christopoulos said a small flatbed truck crashed into a traffic pole, shearing it at the base and blocking the north and southbound lanes on 12-A. 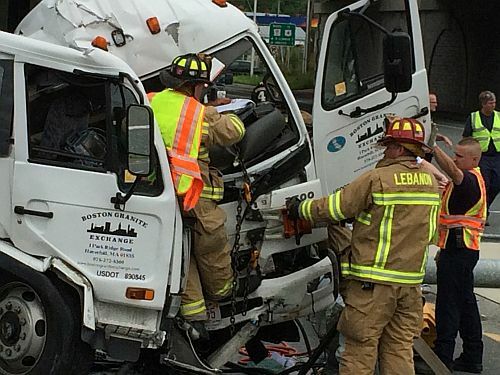 The driver of the truck was extricated from the vehicle and transported to Dartmouth Hitchcock Medical Center. Lebanon Fire and Public Works personnel assisted with the removal of the light pole. The State of New Hampshire Department of Transportation personnel were on scene late Thursday afternoon making repairs on the traffic light pole. The scene was cleared shortly after 1pm. A tree struck by lightning and smoldering for several days caused a forest fire on Coit Mountain in Newport, Wednesday. Newport Fire-EMS hiked up the mountain behind Newport High and Middle School shortly before dark on Wednesday. Lt. Corey Conroy said the firefighters hiked up the mountain to investigate smoke in the woods and discovered a 300 by 400 foot area smoldering near the area of Break Burn trail. Because of darkness, distance, terrain extinguishing was impossible. The firefighters returned on Thursday morning with off road equipment and mutual aid from Newbury, Sunapee and Lempster Fire Departments. Even with the off road equipment it took firefighters 35 minutes to reach the fire area. A call for more manpower went on about 10 am and New London and Claremont Fire Departments arrived on scene and Ascutney VT Fire Department was called in about 11 am manpower. Lt. Conroy said about 35 firefighters helped extinguishing the fire that consumed over one half acre. The fire was under control about 2:00 pm and all departments released from the scene shortly after 3 pm. Overloaded electrical cords and wiring were the cause of a mobile home in Claremont, Wednesday morning. Officials say owner of the 7 Denison Ave property, Arlene Supry heard a popping sound and noticed flames behind the couch. After moving the couch forward, she noticed the entire back of the sofa and wall were involved in fire. Ms. Supry left the residence with a couple of her pets and called 911. Claremont Fire Department arrived shortly before 9 am and had the fire under control about 9:10 am. No injuries were reported but two cats perished in the fire. The mobile home received extensive damage to its midsection and the Red Cross assisted the owner with her immediate needs. Newport, Cornish, and Ascutney Fire Departments helped with the firefight and coverage. Republican candidate Jeb Bush made two local stops yesterday one in New London, and in Newport. Carol Olson of New London was one of the many that came out to see Bush at his stop at McKenna’s. Olson said Bushes ideas for immigration are more practical than Trump’s. Olson says she plans to vote for the ex-governor of Florida because she used to live there. On the way to Keene, Jeb Bush and his staff made an unscheduled stop at Dunkin Donuts in Newport and spoke with a smaller group. Governor Scott Walker. Walker stopped to talk with a crowd of about 100 at One Mile in Sunapee. Two women holding a homemade Walker for President Sign were residents of Wisconsin visiting relatives in Sunapee. Betsey Kennedy said she was there to support Walker for president because he’s not afraid. While talking to the crowd Walker said he would not be afraid to push back. Walker took several questions from the public before meeting with those there individually.